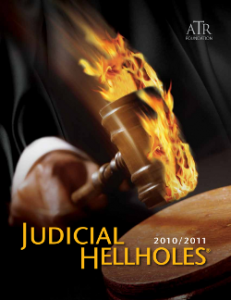 The American Tort Reform Association’s annual “Judicial Hellholes” report for 2010 lists Colorado as one of only three state supreme courts nationwide to qualify for the “honor” (Colorado joins Michigan and perennial favorite West Virginia in being so recognized). Congratulations, Colorado – the legal-establishment special-interest groups that spent so much time and money this Fall (violating campaign finance laws in the process) telling you that our state’s judicial system is “nationally recognized” were right (in that statement) after all. For those of us who would like to see Colorado’s judiciary reformed and recognized for upholding the Constitution and individual rights, we would appreciate your continued support – your comments (Sound Off!) and contributions are still needed. Freedom isn’t free –nor is it always easy to be a Citizen, not a subject.